We all look up to Krista Vansant, and not just because she stands 6-foot-2. 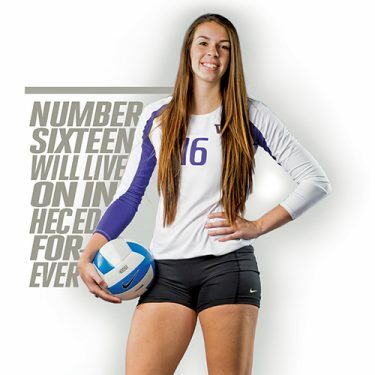 The best volleyball player in UW history had her number 16 jersey retired before the Nov. 8 upset of Stanford. “This means the world to me,” says Vansant, a two-time national player of the year who is now a program assistant for the Husky volleyball team. It was a particular thrill to be honored before the Stanford match because her Huskies knocked off the Cardinal, then ranked No. 1, on her senior night in 2015 before a sold-out home crowd. “That was one of my favorite matches ever,” she recalls.